Brialyn was born and raised on Hawai‘i Island. A graduate of Kamehameha Schools Hawai‘i, she attends the University of Hawai‘i at Manoa entering her senior year of mechanical engineering. She is interested in applying her knowledge of mechanical engineering to a wide range of fields and dreams of eventually getting her master’s degree in the subject. Ideally she hopes to use mechanical engineering to develop renewable energies, learn about space or explore the deep ocean. 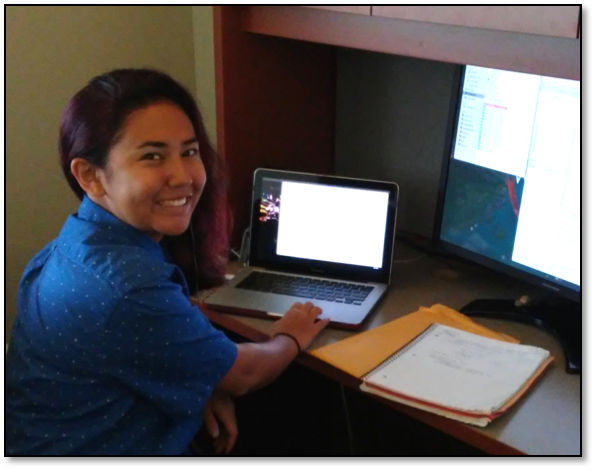 Brialyn graduated from UH Manoa in 2017 with a bachelor’s degree in mechanical engineering and is now an assistant engineer at the Daniel K. Inouye Solar Telescope! See more here: Hilo local hired as an engineer for DKIST, and learn more about our partnership with DKIST. The Daniel K. Inouye Solar Telescope (DKIST) will be the largest solar telescope in the world, housing a primary mirror with a diameter of 4 meters. A mirror of this size will enable DKIST to observe specific regions of the sun in higher resolution and greater detail, but will also be highly sensitive to vibration. To ensure that the image degradation caused by vibration is maintained at an acceptable level, a vibration budget encompassing all vibration sources was calculated. When excluding vibration caused by jitter, there remained 73 milliarcseconds in the vibration budget. Of the remaining vibration sources to be considered, the enclosure is the most prominent source, being subject to vibration output from pumps, wind and motors. To measure how much vibration transfers from the enclosure to the mount pier, tests were conducted using an inertial mass shaker and seismic accelerometers. The shaker was housed in a frame attached to the enclosure and seismic accelerometers were placed on the mount. Then, by imparting force on the enclosure with the shaker and measuring the response with the accelerometers it was possible to collect, filter and analyze the force and response data in MATLAB. To filter out excess noise a combination of band pass filters and window functions were used. By plotting the filtered frequency response function of the data we are able to determine how much energy is transferred and derive the image motion that occurs.